This is a non-commercial website that wants to give you most of interesting and useful information about one of the most beatiful city on the world: Siena. We just try to collect for you most of possible information about the history and the way of life of the "town". Aboutsiena.com is your online travel guide to Siena - one of Italy's best preserved medieval towns, located in the heart of Tuscany. Siena, built on three hills and surrounded by well preserved walls, is filled with fine examples of Gothic architecture and has one of the world's most unique piazzas - Piazza del Campo - (shaped like a shell with scalloped edges). To fully discover and appreciate all that Siena offers, one should visit the city for more than a just a few days. Siena makes an excellent base for other excursions in Tuscany, as it is not far from charming towns such as San Gimignano, Pienza, and towns world famous for wine, such as Montalcino and Montepulciano. Visit Siena! Aboutsiena.com is filled with useful photos, maps, addresses and suggestions for making the most of your time, during your stay in Siena. You will find information on a range of interests such as Culture, Events, Museums, Food & Wine, Shopping and Language Study. 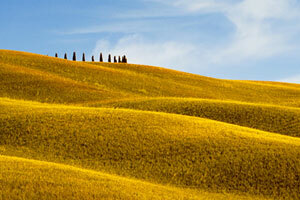 Discover the Terre di Siena! We created a new section dedicated to the wonderful Terre di Siena: Chianti, Val d'Elsa, Val di Merse, Crete Senesi, Val d'Orcia, Monte Amiata and Val di Chiana. Have you already visited them? Do you have some pictures? We would like to create a special photo gallery with photos sent by visitors. If you want, send us your pictures with a short description! We will publish them online and make you aware of it. Send everything to info@aboutsiena.com!